I can’t imagine there are any men who would tolerate trousers without them. My son won’t even wear a shirt unless it has a breast pocket. I have designed and made waistcoats for my husband especially so that he has enough, including one for his phone. Yet women’s wear often leaves them out. When I am making any garment, I consider whether it wants pockets or whether they will be in another layer worn with the item. Sometimes too many pockets can cause unwanted bulkiness. But when in doubt, put a pocket on it. 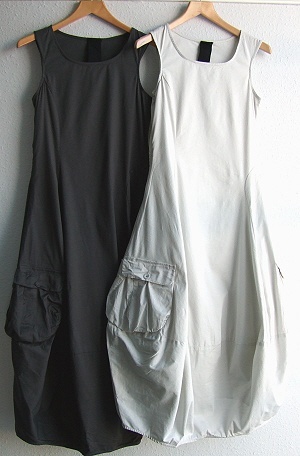 I love the idea of having a slip that has oversized, gathered pockets visible from under a shorter tunic hem. The pocket item’s weight won’t drag the lines of the tunic, dress, or top out of shape. The garment pictured in my collage above, isn’t really a slip dress with pockets but it is standing in for the idea of one. I also like the fabric suggested – a very draped viscose perhaps. It could be a silk or silk blend like my Vietnamese silk, but not a jersey. The weight of pocket items would cause sagging. This is a difficult fabric to find online. I need to be able to touch it. It shouldn’t be too expensive, but of decent quality. In a plain fabric, it is hard to judge from online descriptions whether it is good enough. I’m still trying to narrow down fabric choices for my Spring wardrobe. The three swatches in my mood board are on my short list. They are all on the muted side. I feel that is a lacking element in my warmer weather clothes and sometimes I need to disguise myself as a quiet person. I’ll have to look up teggings!